The Fantastic Four's Invisible Girl gains the power to project invisible force-fields when irradiated by one of Reed Richards' examination devices. Very soon afterwards, they again battle the Mole-Man, this time aided by his Moloid subterraneans. The FF battle Dr. Doom, but Doom’s plan backfires and he finds himself floating in space (again). Rama-Tut, going back to the future after his escape from the FF in ancient Egypt, stops in this time and rescues Doom. He continues on to 4000 AD to become Kang. The Sub-Mariner tracks down the Hulk on a remote island and tries to befriend him. They end up battling each other, but eventually decide on an alliance against the humans. They engage the Avengers at the Rock of Gibraltar (Thor and the Hulk face off.) 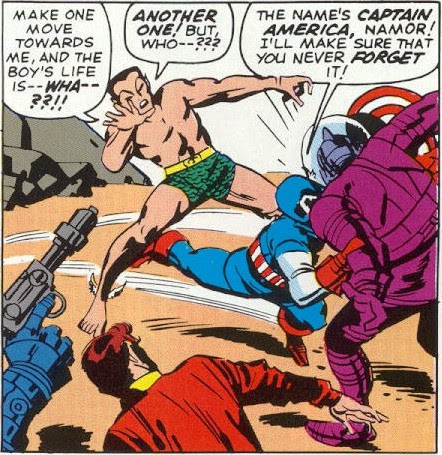 Eventually the Hulk becomes tired of Namor’s arrogance and when he involuntarily turns back to Banner he escapes the conflict, leaving Namor alone against the Avengers. In the Arctic while searching for his lost people, Namor discovers (but doesn’t recognize) Steve Rogers in a block of ice. He throws it into the sea, where it is eventually found by the Avengers. Captain America is revived after being in suspended animation for almost 20 years. The Avengers ask Cap to join them and he accepts. The Hulk reads that the Avengers have replaced him with Captain America. While the Avengers search for him in the Southwest, the Hulk heads to NY. 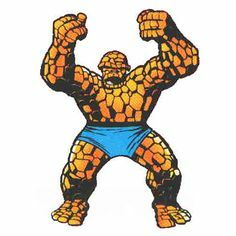 Despite an epic "Battle of the Century" with the Fantastic Four's Thing, the Hulk captures Rick Jones whom he feels has betrayed him for Captain America. Eventually both the FF and the Avengers attack the Hulk together. The Hulk escapes but the FF and the Avengers part as new found allies. When the Sub-Mariner kidnaps Susan Storm the rest of the FF come to the rescue with the assistance of Dr. Strange. Sue declares her love for Reed once and for all. Thor's brother Loki convinces their father Odin to order Amora the Enchantress and Skurge the Executioner to break up Thor and Jane Foster. Things escalate and they end up attacking them. Odin exiles them to Midgard (Earth) for their over-zealousness. In China, Iron Man first faces the Mandarin, his eventual arch-enemy. The Soviet spy Natasha Romanoff (the Black Widow) attacks Stark in retaliation for defeating the Crimson Dynamo and causing his defection. Ivan Vanko, the original Dynamo, sacrifices himself for Tony. The Unicorn menaces Iron Man. Master archer Clint Barton (Hawkeye) meets and falls in love with the Black Widow, who convinces him to attack Iron Man. Back in NY, the Avengers are attacked by Captain America's old foe from WW II, Baron Zemo, who has gathered a new group, the Masters of Evil, made up of the modern (criminal) Black Knight, the Melter, the Radioactive Man and Zemo himself. Captain America pursues Baron Zemo to South America to get revenge for causing his sidekick Bucky’s death in 1945. Zemo allies himself with the Asgardian Enchantress and the Executioner, but after Zemo returns to NY, Thor sends them all into a space warp. Kang the Conquerer returns here from the future (4000 AD) to attack the Avengers for the “first” time, but is defeated with the help of Rick Jones. Baron Zemo, the Enchantress and the Executioner create the super-human Wonder-Man from failed businessman Simon Williams. They force him to attack the Avengers, but he sacrifices himself instead and seemingly dies. The time-traveler, Immortus (a future version of Kang the Conquerer), visits Baron Zemo and pretends to help him against the Avengers in order to trick his younger self Kang into thinking he is evil. Loki frees the fire demon Surtur and the storm giant Skagg on the Earth, who are eventually defeated by Thor, his friend Balder, and Odin, who walks the Earth for the first time in an eon. Dr. Don Blake saves Dr. Strange's life, after which he aids Thor in defeating Loki. Dr. Strange battles Loki and barely survives before Loki retreats from the appearance of Thor nearby. Spider-Man meets the electricity-wielding Electro. Spider-Man battles Dr Octopus again but in the conflict Betty Brant's brother is killed. This traumatizes Betty against Spider-Man and cools her relationship with Peter. Later he fights Mysterio, who uses Hollywood stage tricks to defeat his enemies. Spider-Man is tricked by the mysterious Green Goblin into going out to Hollywood to make a movie. During the fight they accidentally stumble onto the Hulk's underground lair. The Hulk drives everyone away and the Goblin escapes. Spider-Man encounters big game expert Kraven the Hunter. The Sinister Six (Dr. Octopus, Electro, the Vulture, Sandman, Kraven and Mysterio) attack Spider-Man, but all are defeated. The X-Men battle the immovable mutant, the Blob after a failed attempt to recruit him. Quicksilver (a speedster) and the Scarlet Witch (who affects probabilities) are recruited by Magneto after he rescues them from villagers afraid of their mutant powers. Magneto and his new Brotherhood of Evil Mutants (Toad, Mastermind, Quicksilver and the Scarlet Witch) invade the Latin American republic of Santo Marco. They are defeated by the X-Men, and Quicksilver begins to doubt Magneto due to his bloodthirstiness. The Puppet Master and the Mad Thinker trick the X-Men into attacking the Fantastic Four. After a pitched battle the true villains are revealed. Unfortunately they escape, but the FF and the X-Men part as new allies. The FF go to Eastern Europe for a vacation. Unfortunately Ben Grimm is compelled to free the evil alchemist Diablo, who was trapped in a castle for 100 years. Grimm realizes his error and shortly reseals him. The FF learn that Doom is actually the ruler of the European nation Latveria. Reed and Doom have a mind-battle using the encephalo-gun, in which Reed tricks Doom into thinking he has won. Shortly after, the Mole-Man attacks and Sue is injured. She is saved by her long-lost father, Dr. Franklin Storm. Later in a conflict with the Super-Skrull, he sacrifices his life to protect the FF. Namor returns to the throne of the undersea Atlanteans but he is soon attacked by the underwater armies of Warlord Attuma. The FF assist him in repelling Attuma. Matt Murdock’s father is killed by the Fixer. Matt and his friend Foggy Nelson open a law practice and hire Karen Page, whom Matt falls in love with. Matt creates his identity as Daredevil and avenges his father's death with his superhuman radar skills. Daredevil encounters the Owl, and then the Purple Man. Spider-Man meets Daredevil for the first time in a battle with the Ringmaster and his Circus of Crime. Meanwhile Liz Allen becomes attached to Peter. Betty Brant gets jealous and starts dating Ned Leeds. Dr. Strange journeys to the Dark Dimension to battle the most dangerous mystic of all, the Dread Dormammu. There he befriends Clea, the daughter of Dormammu's exiled sister Umar. Strange defeats Dormammu by helping him stop the destructive Mindless Ones and putting Dormammu in his debt. The Ancient One rewards him with a new Cloak of Levitation and the Eye of Agamotto. Reed has two reactions to Sue's force field. The first indicated that it's what he was already trying to get. The second suggests he was experimenting on his wife by exposing her to deadly radiation. Lee didn't know enough about the effects of radiation to know that only a truly evil person, incapable of empathy, would do that. It's better to say that she already had the power, and testing plus exercise brought it out, since that is compatible with Reed's initial reaction. While testing her powers, her force field manifests for the first time.